John: Formerly with The United States Dept. of Housing and Urban Development (FHA) involved in Real Estate appraisal, Mortgage Loan Servicing, and Underwriting FHA home loans. Taught Real Estate classes at Jefferson Community College, and completed College Courses in Real Estate Law, R.E. Development, R.E. Finance, R.E. Principles, and Property Management. John is a Licensed Broker in Florida. 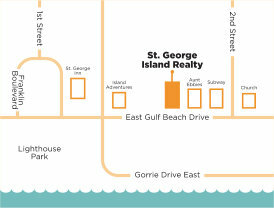 John was a Top Producer at three other Island Real Estate Agencies prior to starting St. George Island Realty, LLC. Kristen: Currently working full time as John's assistant in the various areas of marketing, customer database management, closing coordinator, mailings, and general "behind the scene" details. She was the Marketing Director of Collins Vacation Rentals; coordinating advertising with nationwide and local publications; maintaining the rental properties on their website; details and photos; as well as producing the Collins Vacation Rentals catalog for 3 years. She was the Office Manager for a St. George Island builder, a Customer Service manager for 8 years, and the Office Manager for an Architect firm for 3 years. John Shelby and his wife, Kristen, selected St. George Island as the place to live in 1992, after having visited most of the coastal communities along the Southern Atlantic and Gulf coast. John has been a top producing REALTOR focused on St. George Island since 1993. He was previously in more specialized Real Estate related fields. John's real estate finance and appraisal knowledge gained from his previous career as a Mortgage Loan Servicer and Underwriter with the United States Dept. of Housing and Urban Development propelled him to "Top Producer" status in his first year as a Realtor. He is routinely one of the top producers on St. George Island. Education: John earned a BA degree with two majors in Philosophy and English in 1977. More recent college courses in the late 80's and early 90's include Real Estate Law, RE Appraisal, Land Planning & Development, Property Management, RE Finance, RE Principals and RE Investment along with MBA courses in Mortgage Loan Underwriting, SREA courses in Appraisal, and numerous Dept. of Housing & Urban Development courses in Appraisal, Loan Servicing & Loan Underwriting. John accumulated over 1,000 college level classroom hours between 1987 and 1992 in Real Estate specific subjects. Kristen has a BS degree in Business Administration with a major in Office Management. She has Real Estate licenses in both Kentucky and Florida. She is also a Dale Carnegie course graduate. Awards: John was awarded the CENTURION award for production levels in the top 2% of Realtors nationwide while at CENTURY 21. In 1999, he was awarded both the CENTURION award and the most coveted "Quality Service" award; two awards rarely earned in the same year by one REALTOR. John has been awarded the "Platinum Award" by the local Board of REALTORS ever since its inception. This award is given only to REALTORS who exceed 10 million dollars in gross closed commissions. Community service: John has been a member of the St. George Island Volunteer Fire Dept. & Medical First Responder squad; 1996 President - St. George Island Civic Club spearheading the bike path, basketball court, planting palm trees, central public beach development plans and Dixie Theatre. While in Kentucky (pre-island life), President Plainview Kiwanis Club (1986), Scout Master and Eagle Scout. Real Estate Philosophy: John has completed more than 10 times the education required to become a Real Estate Agent. He shares that knowledge with his clients to enable them to make informed Real Estate decisions based on the big picture, not just a few choices and limited information. Specializing in St. George Island, he uses his thorough knowledge and understanding of the market to guide you through whatever stage of interest you may have; just curious, best investment, wanting to sell & get top dollar, rental income return, short term verses long term benefits, lot or house, you name it! John has built his reputation by answering the most difficult questions from the most knowledgeable, intelligent and demanding clients.